The transition road connecting the 710 Freeway to the eastbound 91 Freeway will be closed until at least 9:30 a.m. after a big rig carrying an oversized load of metal smashed into an overpass, the California Highway Patrol said today. Cleanup crews dispatched a heavy-duty crane to clear the wreck, which occurred about 3:45 a.m., according to CHP logs. LANCASTER (CBSLA.com) — Two 16-year-old boys were killed Monday evening in a big-rig collision in Lancaster, officials reported today. Around 6:50 p.m., the two-vehicle accident occurred at Avenue D and 60th Street West, where the truck crashed into a 2002 Toyota Prius. Officials reported the driver of the Prius was killed at the scene, and resided in Palmdale, California. SKY9′s Kevin Takumi reported yesterday that the passenger, from Piedmont, Oklahoma, was pulled out of the vehicle using the Jaws of Life, and was taken to a hospital where he later died. Rodolfo Marcello, 55, of Little Rock in the Antelope Valley, was identified as the truck driver who survived the crash with no injuries, officials reported. A SigAlert was issued by the California Highway Patrol where traffic was stalled on Avenue D as crews cleared the wreckage yesterday evening. At this time, identities have not yet been released for the two boys. Traffic on Highway 152 backed up for hours Monday as a vehicle collided with an overturned big rig during the morning commute, according to the California Highway Patrol. A 2005 freightliner pulling a utility trailer was traveling westbound east of the Romero Visitor Center at 3:03 a.m. when the driver ran off the road onto the north shoulder and overturned, blocking all lanes, said Officer Dean Emehiser, spokesman for the CHP Los Banos office. Traffic was partially blocked on Highway 152 for more than nine hours as a result of the accident, Emehiser said. The driver of the Freightliner, Daniel Rosales, 44, of Baldwin Park, suffered minor injuries. He was tended to by three motorists, Nick Flygenring, Rueben Huerta-Orozco and Abdikani Jelle, following the crash. Mulford Bowles, 69, of Sherman Oaks, drove a 2007 Dodge Ram westbound, encountering slow traffic from the accident. Mulford attempted to merge, spotted the big rig and slammed the brakes, but still hit the freightliner, CHP officials said. Flyginring, 38, of Northridge, suffered minor injuries; Huerta-Orozco, 44, of Los Banos, suffered moderate injuries; and Jelle, 25, of San Diego, had major injuries from the crash. Mulford was unharmed. Emehiser said Flyginring refused treatment, Huerta-Orozco was taken to Memorial Hospital, Los Banos and Jelle was taken to Doctors Medical Center in Modesto. 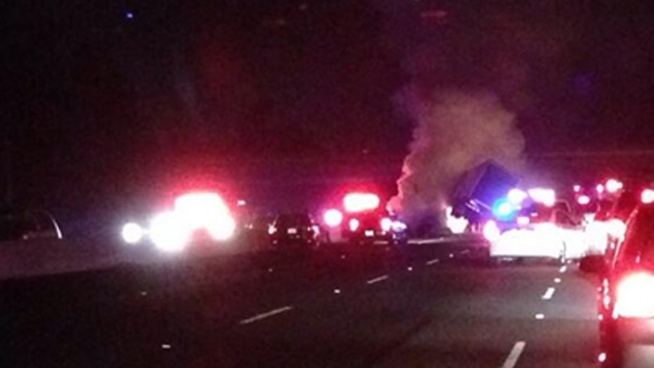 CHP officials said alcohol and drugs are not suspected to be involved in this incident. NBC4 viewer Megan Moureaux sent this photo of a big rig crash on the 101 Freeway in the Thousand Oaks area on Sunday, June 29, 2014. All lanes on the 101 Freeway have re-opened after a fiery big rig crash forced the closure of both sides of the freeway in the Thousand Oaks area on Sunday night, the California Highway Patrol said. The semi-truck was eastbound about 9 p.m. at Lindero Canyon Boulevard in Westlake Village (map) when it struck the center divider, sending debris into the westbound lanes and spilling diesel fuel onto the road, the CHP said. The truck became engulfed in flames. Two westbound vehicles collided with debris that was scattered across the freeway, officials said. CHP had reopenend all of the westbound lanes just after 3 a.m. and cancelled the sig-alert for the eastbound side just before 4 a.m.
Two people were killed and three were seriously injured when a dump truck broadsided them on Interstate 15 in the Cajon Pass, officials said. The incident was reported at 11:41 p.m. Tuesday, June 24, on the southbound ramp to Highway 138, a CHP incident log stated. A 54-year-old Ontario woman was driving a Peterbilt dump truck south on the off-ramp at Highway 138 when, for unknown reasons, she ran a stop sign at the end of the ramp and struck a PT Cruiser that was traveling west, said CHP Officer Ryan Dallin. The truck pushed the car off the highway and down an embankment. The truck then ran over the PT Cruiser and struck some thick metal pillars bringing the truck to rest on top the the car, Dallin said. The five people inside the car were trapped and firefighters took about four hours to free them, he said. Two people were pronounced dead on the scene: the driver, 18-year-old Nicole Brittney Lyle, of Victorville, and 16-year-old John Anthony Cabrera Jr., of Phelan, a coroner’s news release stated. Paramedics rushed the three other passengers to Arrowhead Regional Medical Center with moderate to major injuries, Dallin said. The truck driver suffered minor injuries. Whether drugs or alcohol was a factor was unknown. No arrests have been made in connection to the crash, Dallin said. The eastbound Highway 138-southbound Interstate 15 connector road was closed for several hours. A child was killed and several others were injured, including another child, in a crash involving two big rigs and a minivan on the 10 Freeway in Santa Monica Friday, officials said. Two big rigs and a minivan collided around 12:35 p.m. on the westbound 10 Freeway near Lincoln Boulevard at the McClure Tunnel, according to the California Highway Patrol. Nine people were injured, seven of them passengers in the minivan. Two children under the age of 12 were taken to local hospitals in critical condition, six with moderate injuries and one person declined medical attention. One of the children died in the hospital, Santa Monica Fire Department Deputy Chief Tom Clemosaid. The child's age was not immediately released. Traffic was backed up to the 405 Freeway before crews cleaned up the wreckage from the McClure Tunnel and reopened the freeway just before 7 p.m.
Aerial footage showed one big rig resting upright inside the tunnel around 1:45 p.m. The CHP’s traffic incident page indicated about 100 vehicles were stuck between the crashed trucks and Lincoln Boulevard. Los Angeles firefighters were assisting the Santa Monica Fire Department with the call.